Barron, the episcopal vicar of the Santa Barbara Pastoral Region, which is part of the Archdiocese of Los Angeles, received a doctorate in sacred theology from the Institut Catholique de Paris in 1992. He told NBC News that while studying in Paris, he lived just blocks from the cathedral. "Every Wednesday for the three years, I was there I gave tours at Notre Dame," he said. "I lived about a 10-minute walk from there. It was a very special place for me personally. For Catholics, it's of extraordinary significance." He said the world-famous church "sums up so much of the Catholic history and spirit." 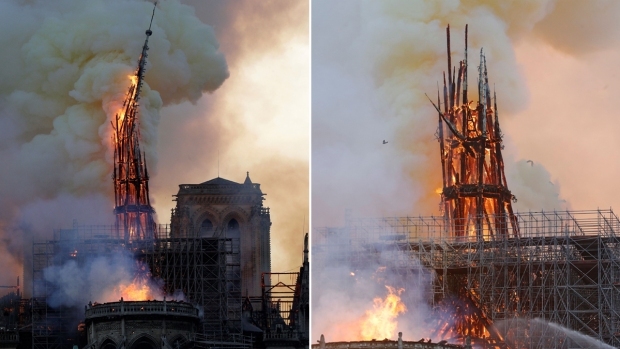 "It's meant to symbolize the body of Christ, meant to symbolize the Cross, which you can see in the design of the cathedral," Barron said. "This one has survived so much. It survived war and revolution and social change." He noted that many of the building's windows date back to the 13th Century, while the iconic spire that toppled in Monday's fire was added during a 19th Century renovation. "Much of that building is very authentically medieval, especially the windows, that are magnificent," he said. "It's a spiritual center for Catholicism, but also I think for all of Europe its a spiritual center. "And then, from a cultural standpoint... it is the most visited site in Paris, meaning one of the most visited sites in Europe. (It's) heartbreaking as I look at these pictures. It's devastating to me personally as well as all Catholics."